A 0.5 pitch module worm wheel to suit a 0.5 pitch module worm. The worm wheel is supplied in bronze with a bore tollerance of H7. 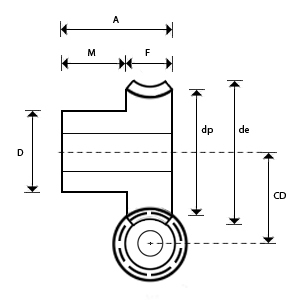 Standard tolerances, unless otherwise stated are +/- 0.25mm with all dimensions in mm. For special worm wheels or reworked worm wheels please email us Click here to get a quote.